All Black Friday long I was waiting for some deals for Kindle family but only Kindle DX was in the list at $259 (down from $379). Now all our hopes goes to Cyber Monday. I know that Kindle Fire is already under-priced as it costs $209.63 to build and Amazon sold it at $199. Using this strategy Amazon try attract as many Kindle Fire customers and make profit by selling content (books, subscriptions to magazines and newspapers, app). Also, all Kindles has a sponsored screensavers version so already Amazon cut the price as lower as possible. A Kindle Cyber Monday deal may generate huge sales but are Amazon ready to handle it? If there will be some limited quantities people will be disappointed like last year, if Amazon will push more then the lost can be too high even for Amazon. Behind the curtains are done a lot of marketing calculations and strategies to be sure that the final decision will be the best for Amazon. 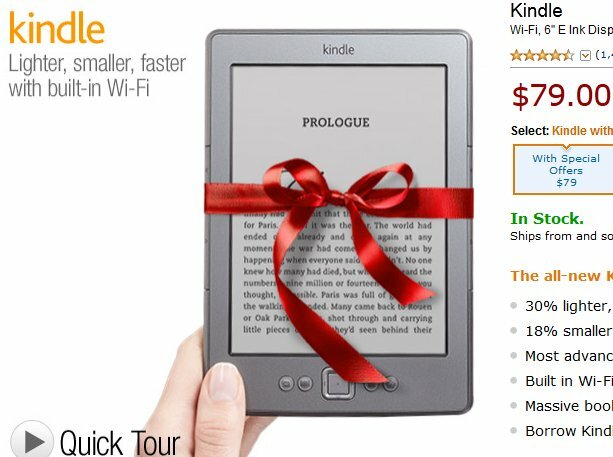 Will there be a Kindle deal this Cyber Monday? Mainly this Cyber Monday I’ll looking for Kindle deals like ebook readers accessories and ebook deals. But I’ll check the Kindle devices hourly to see if we are in luck for some amazing Kindle Cyber Monday sales.